Are you interested in practicing fly fishing? In a lake, a river, or a small stream? Catching trout, grayling, black bass, or even pickerel? Would you like to discover or learn a new technique in particular: fishing with dry flies, nymphs, streamer flies, or drowned (?)! Would you like to improve precision or distance throwing? I would like to share with you my 15 years experience as a fly fishing guide. 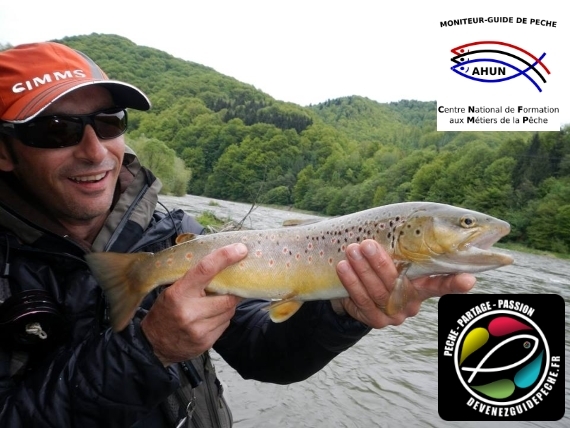 French team sport fishing vice champion, 10 years of experience as guide and co-manager of Lake of the Landie, FFPS (French Federation of Sport Fishing) monitor. I look forward to hearing from you. L’équipement pour un voyage de pêche type Slovénie ou Pologne.